Introducing our 3-Step Power Pack! Experience the miracle of PARNEVU T-Tree Oil in a sample-size tri-packet that will cleanse, repair, and add shine to your hair. Featuring our therapeutic T-Tree Shampoo to help stop the itch and lock in moisture; Ultra Deep Repair Conditioner (not sold separately) to repair hair and prevent breakage; and Cream Glosser with Humidity Guard for a long-lasting, healthy shine. 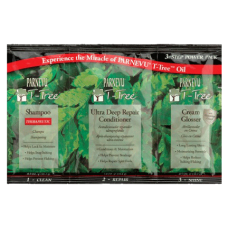 This tri-packet contains just enough product for a quick-fix remedy to damaged hair, grab-and-go to the gym, or travel convenience.